The ongoing construction of the LRT Line 2 Extension has reached a point where it is clear that several pedestrian overpasses will be affected by the project. 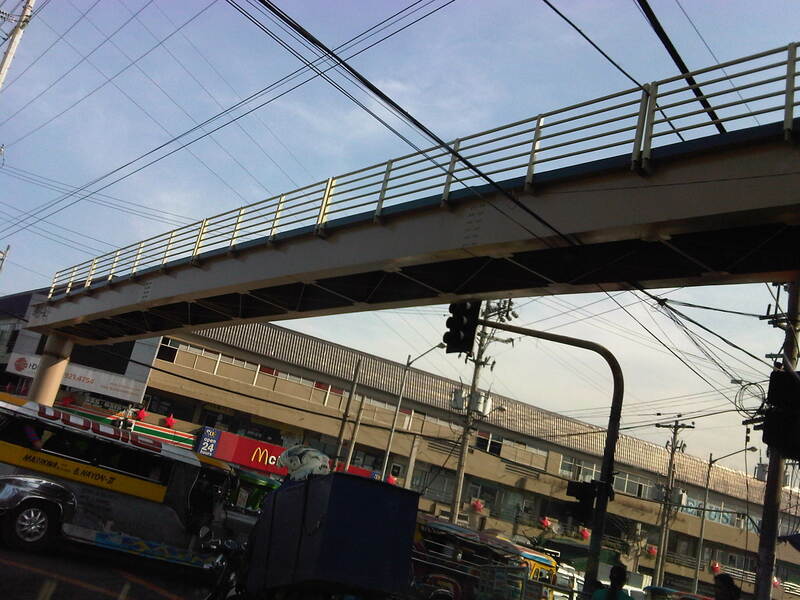 Following are photos of overpasses between Angel Tuazon Ave./Felix Ave. and Masinag. Most are clearly along the elevated superstructure of the Line Extension and will have to be redesigned if not removed. Some are relatively new and so brings some questions whether those behind the overpasses coordinated with the proponents of the Line 2 Extension project. The practically new pedestrian overpass near the Vermont Royale subdivision gate will have to be redesigned to give way to Line 2’s elevated tracks. This is the view along the westbound side of Marcos Highway. Hopefully, the design will not be similar to the somewhat awkward and, some say, ‘people-unfriendly’ designs of overpasses along EDSA due to the MRT 3 tracks. Here’s a view of the same overpass from the eastbound side of Marcos Highway. Another overpass that will have to be dismantled from the looks of the columns currently under construction is the one near the Filinvest East gate. The overpass across from SM Masinag may also have to go but since there will be a stations to be constructed in this area, there is an opportunity to integrate the pedestrian walkway with the elevated station. I will try to take photos of other overpasses between Santolan and Sta. Lucia that may be affected by the construction of the Line 2 extension. The ones across Robinsons Metro East and De La Paz though might be integrated with the station that is to be constructed in the area. This would be similar to the SM Masinag overpass, which will presumably be integrated with the Masinag Station of the Line 2 extension. A photo went viral over social media last year about power lines jutting out of a pedestrian overpass in Metro Manila that also happened to be a steel structure. There are others like it that were constructed with the implementors not paying attention to the details, that is referring to the power and communication lines or cables that are practically everywhere in Metro Manila and other cities. I give the designers the benefit of the doubt as they likely did the designs assuming there were no constraints such as the overhead cables and wires. It is clear in the photo that the main reason for the very crowded overpass is the presence of vendors on the overpass itself. 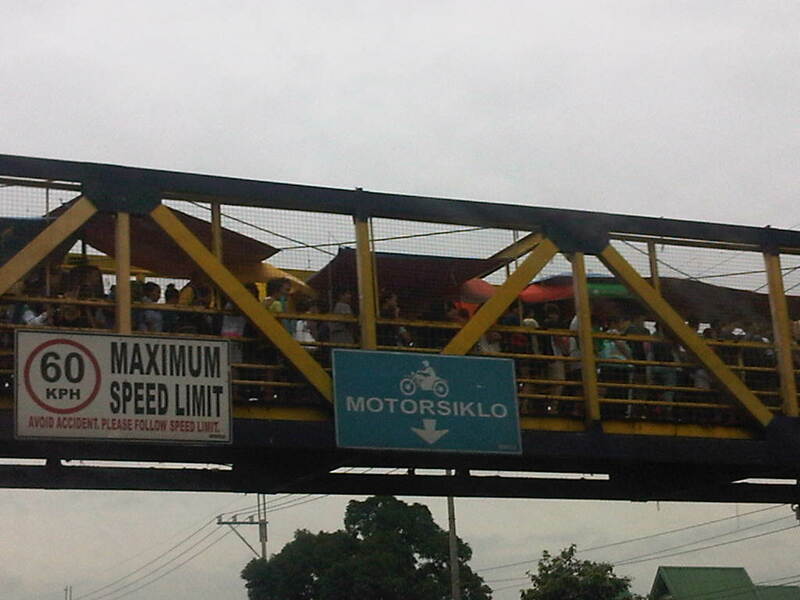 This seems to be the case in many other overpasses in other commercial areas (e.g., Quiapo, Ortigas, Cubao, etc.) where vendors practically occupy half of the area along the overpass thereby constricting the space people can use to cross the road beneath it. Who is in-charge of these overpasses? Do local governments or the MMDA tolerate such practices by vendors? I already answered the first question – the MMDA and local government units are in-charge and are responsible for keeping these facilities clear of other activities other than pedestrians using the overpass to cross the road. I recall that there are actually ordinances with the MMDA and the respective LGUs pertaining to the proper use of overpasses and there are actually penalties for vendors and others setting up shop on these facilities. Judging from the scenes atop the overpasses that we see every day (e.g., the photo above), it is clear that the people in-charge are neglecting their work (surrender na?) and this is clearly an inconvenience to pedestrians, many of whom can also be seen crossing the wide Commonwealth Avenue and risking their lives and limbs as they evade motor vehicles including zooming buses along the highway. These are examples of challenges that pedestrians face everyday and something authorities should be urged to act on and immediately and decisively. Such action should not only be for the case of overpasses but to sidewalks and other pedestrian facilities as well. These have significant implications to road safety as well as the efficient use of transport facilities and improvements will surely enhance quality of life as well. We cannot claim to promote walkable communities if we fail to deliver on the spaces that are supposed to be for walking. And we cannot promote healthy cities without having such spaces for people to be encouraged to walk. There was a photo that circulated in social media the last two weeks showing electric and telephone cables coming out of the stairs of a steel pedestrian overpass. It was obvious that the people responsible for both the overpass (MMDA) and the cables (power and phone utilities) did not coordinate their work and so people had to risk electrocution to be able to cross the street at what is assumed to be a busy intersection. Such is an example of unsuitable designs and bad implementation of infrastructure projects; in this case, that of a pedestrian facility. There are many other examples of these flawed execution of projects including electric posts in the middle of lanes after road widening projects, short span pedestrian overpasses that are not utilised by people (preferring to cross at ground level) because the road was narrow in the first place. Many are a waste of resources considering they may not have been required in the first place if careful assessment were made about the situation. 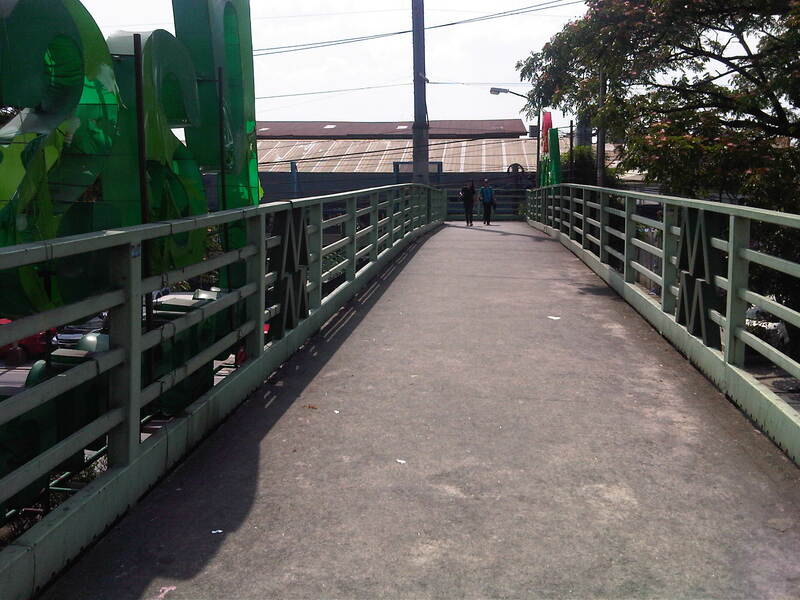 The pedestrian overpass under construction at the Masinag junction (photo below) is a good example of what looks like flawed design. The elevated walkway is narrow and is located right at the corners of the intersection. The width is important here because there are many people usually crossing at Masinag and the overpass can become congested for users. 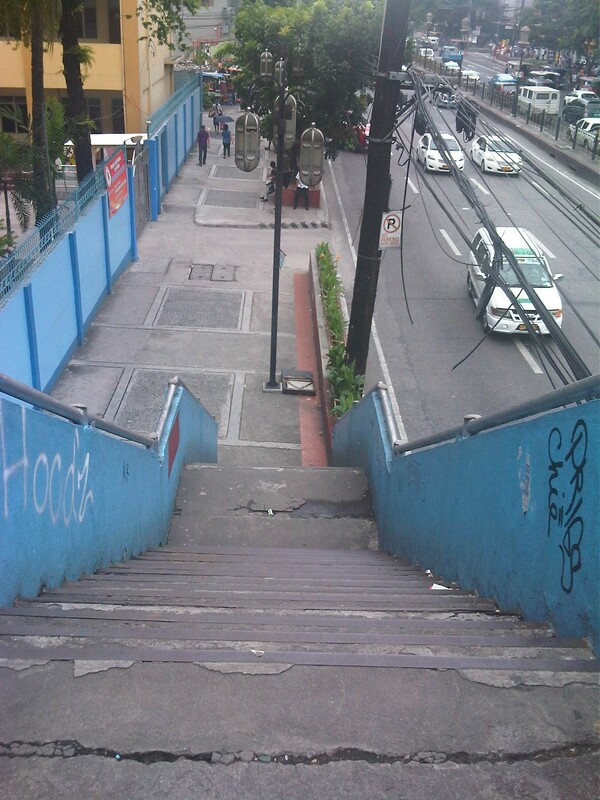 The stairs have not yet been constructed but if past designs of overpasses like this is to be considered, the stairs will likely be steep and therefore difficult to use for senior citizens, PWDs and children. Note, too, in the photo that the bridge already obscures part of the traffic signals previously installed at the intersection. This means the lights would have to be reinstalled or transferred so motorists can clearly see the signals. My friends at the DOTC tell me that it is only a matter of time before the Line 2 Extension project is bidded out an construction finally goes underway. Depending on the the final design of the line and end station, there might be a need to revisit the pedestrian overpasses along Marcos Highway. Hopefully, they don’t become like the overpasses along EDSA that had to be raised more due to the elevation of the Line 3 facilities including the catenary for the trains. 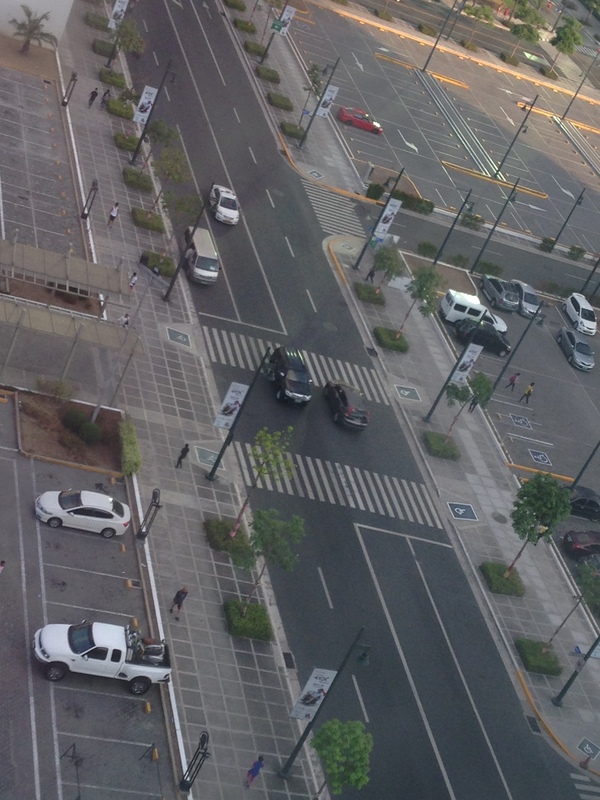 I’m sure there is a suitable design for pedestrian facilities for crossing the wide Marcos Highway. It only requires careful thinking and creative minds to come together to come up with the appropriate facilities.